LibreOffice is a productivity suite that is compatible with other major office suites, and available on a variety of platforms. It is free software and therefore free to download, use and distribute.This is openoffice fork. I was trying for a couple of hours with no results and this solve the problem. instead of 3.3-9526 . Please update that in the main post. Any idea as to what I am doing wrong? You have to adapt the command to the directory where you extracted the archives. Use the TAB key to auto-complete the command line. Why the heck you don’t read readme.txt after you downloaded and extracted LibreOffice? The installation is easy, just 1 command in terminal needed. Now thanks to you I know how to install any deb package from the desktop. I have Ubuntu 10.04 and am using OpenOffice 3.2; I just downloaded LibreOffice and want to install but I don’t want to erase my OpenOffice. 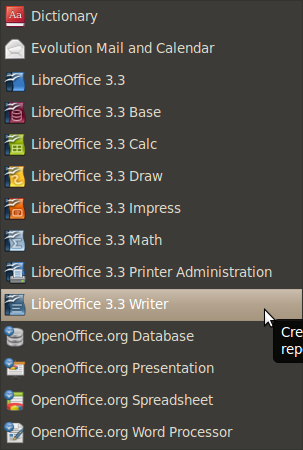 If I install LibreOffice will it leave my OpenOffice alone? One note to anyone new to this sort of thing: make sure the .deb files are executable as well. I had this issue. What tony says… again, thank you! If removing Open Office is OPTIONAL then users do not NEED to remove it, right? Some people will surely gloss right over the note provided, as such, this point could definitely be made more clear since, as-is, it’s presented contradictorily.